Da Capo Press, 9780306817748, 262pp. This much is clear to me. If I can't change my own life in response to the greatest challenge now facing our human family, who can? And if I won't make the effort to try, why should anyone else? So I've decided to start at home, and begin with myself. The question is no longer whether I must respond. The question is whether I can turn my response into an adventure. 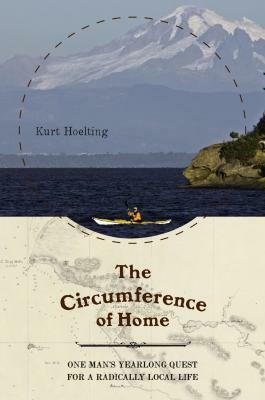 After realizing the gaping hole between his convictions about climate change and his own carbon footprint, Kurt Hoelting embarked on a yearlong experiment to rediscover the heart of his own home: He traded his car and jet travel for a kayak, a bicycle, and his own two feet, traveling a radius of 100 kilometers from his home in Puget Sound. This "circumference of home" proved more than enough. Part quest and part guidebook for change, Hoelting's journey is an inspiring reminder that what we need really is close at hand, and that the possibility for adventure lies around every bend. Kurt Hoelting, commercial fisherman, wilderness guide, and meditation teacher, is the founder of Inside Passages, a sea-kayaking outfitter and guide business in Alaska. Hoelting lives with his family on Whidbey Island, Washington.